Within three weeks, members of the fifty year old apex regulatory body for human resource management and practice in Nigeria will be electing its 19th President. As I reflected on the candidates for the presidency of Nigeria’s Chartered Institute of Personnel Management, a recent Social Media group conversation I had, came to mind. I countered a post which had a list of Senate Presidents of Nigeria since independence. The post posited that from Nnamdi Azikiwe in 1960 through Chuka Okadigbo in 1999 to Bukola Saraki in 2015 till date, only Saraki was a Muslim. My immediate reflex was what has religion got to do with the Senate Presidency? The gentleman that initiated the post promptly told me to work out the arithmetic and won’t discuss the matter further despite my direct and indirect prompting. As you may suspect the chap in the chat is himself a Muslim. Because the thought won’t go away from my head and the troublemaker had left me on my own to work ‘the arithmetic’ out, I took the conversation home to the dinner table. My sons were quick to unusually side with me on the matter after I had laid out my case. Or so I thought until this: one of the sons dutifully reminded me that unfortunately Federal Character is still in force in ‘your country’. Once ‘your country’ drops in a conversation, I know I am up for a major ridicule because the issue in discussion makes no sense to them. The other son, in a much lowered and measured tone asked if the norm of having a joint ticket of Muslim and Christian Presidential and Vice Presidential candidates had been abandoned? What about the unwritten gentleman’s agreement within political parties of rotating the presidency between the North and the South? ‘Still in force, Daddy?’ He asked with his head bent over forward towards me. Just when I thought the rebuke and gang-up could not get any worse, the other son quipped in clearly mildly irritated: when your generation and those before you make laws or create norms that turn out to stir trouble, I don’t understand why you simply can’t get rid of it. My generation will have none of those retarded laws, policies or norms. There is something called merit-based appointment, blind of ethnicity or religion, he concluded. In between the mounting case against Federal Character and its likes, I barely managed to explain to them that the idea of fair representation and creating a sense of belonging for all who share a common space as a country isn’t such a bad idea. I favour it to the extent that it is meant to correct existing deficits, for equity and justice and must be limited in time. Clearly I was on my own on this one. Even at that, these amalgam of views dominated my mind as I thought about the race to be President of the CIPM. There are two candidates. One is a Christian-Yoruba from Oyo State and the other is a Muslim from Kogi State. Of the 18 Presidents till date, all but five are of the Yoruba extraction leaving a significant number of influential people writing the Institute off as ‘that Yoruba Institute’ . No past President was a Muslim, none from neither the Middle Belt nor the Northern Hausa-Fulani extraction. The thoughts, sometimes conflicting with my core beliefs as it were, raged on. In the end, I was left with what I could consider my balanced position, which is that a chance to allow a new face for the CIPM beyond the dominant Yoruba ethnicity so far, should be a welcome one as long as quality is not compromised. This will send a clear signal out there that we are all in it together and begin the prospect of dispelling the notion that this strategically important national body is for only one of the diverse ethnic and religious groups that Nigeria is blessed with. My so-called balanced position notwithstanding, when I go to bed on the eve of the announcement of the result of the contest, I will sleep soundly. Here is the reason: both candidates in the run for the President are supremely qualified and competent professionals. I know one personally since 2009. He was then the Registrar / CEO of the institute when I resolved to set up Nigeria Human Capital, an outfit that activates an interface between world-class human capital including Nigerians in Diaspora and Nigerian corporates for mutual benefits. He became my natural partner in that journey and my experiences working with him was positive. I do not know his opponent and have not had the privilege of meeting him but some of my well respected and trusted Associates know him and adjudge him to be a potential good President. And I have no reason not to believe that that is the case. 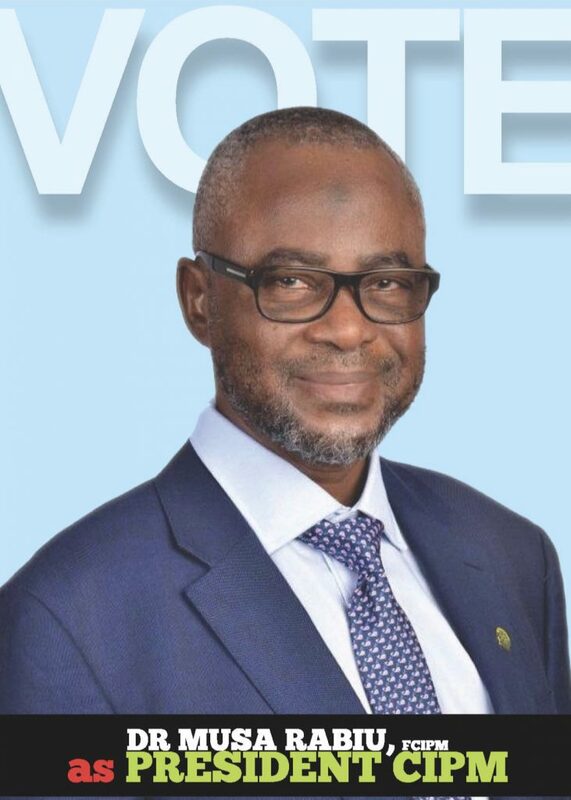 However my support to become the 19th President of the Chartered Institute of Personnel Management (CIPM) of Nigeria goes to Dr Musa Rabiu who, when elected will coincidentally be the first from the Middle Belt geo political zone and the first Muslim to occupy the position. Those are neither the only nor the main reasons that Musa is the best President the Institute has never had. He is people manager extraordinaire, an astute negotiator and has an uncommon balance of fair-mindedness and a sense of realism. He knows when empathy applies and when to be the hard negotiator. In my dealings with Musa, I found him to be strategic and self-driven in his human resource management dealings. This derives from his over 30 years rich cross-functional and cultural experience impacting organisational success. Passionate to provide leadership in human capital development nationally and globally, Musa in his role as Registrar / Chief Executive Officer facilitated unreservedly the founding of Nigeria Human Capital. He did this as far back as 2009 when the role of the Diaspora in repositioning Nigeria was an unpopular idea. Musa’s foresight of supporting projects and processes that will link the institute with its teeming Diaspora population is one that will deliver unrivalled dividends for Nigeria should he be elected President in April 2019. A current Group Chief Human Resources Officer with Dangote Group Nigeria, Dr Musa Rabiu aims to use his time in office as President to strengthen current CIPM governance structure, empower and hold Management & Branch Leadership accountable and promote an all-inclusive process of membership of Committees and other leadership positions. It is my expectation that the CIPM Membership Brand promotion that Musa envisages, will include what I call ‘Diaspora Marketing’. The capacity is available and there is certainly the appetite amongst the Diaspora to engage Nigeria’s apex human resource body in its vision of becoming the foremost people management and organizational development institute in Africa, respected across the world. My time with the Institute while partnering to establish Nigeria Human Capital and association with Musa in different capacities since then has left me with the firm belief that there is no person better suited than him to accomplish the CIPM mission of promoting excellence and regulating the ecosystem for people management to deliver value for sustainable individual and organisational growth and by default the growth of Nigeria.